Submitted by Jason on Wed, 10/05/2011 - 22:29. I don't know if this has ever happened to you or not, but it certainly happened to my band more than once. You've just finished a gig or a rehearsal session and while you're loading your gear - someone quietly picks up your guitar and steals it. I wish we had Rock Lock then. You may recall we told you about Rock Lock back in October last year - now it's available to order online. I've exchanged a few emails with the inventor Chris Goulet who is understandably quite enthused about now having the product available to buy online. Chris has told me that it's being used both by guitarists, and also by shops to prevent theft. If you work in a guitar shop, Chris points out that not only does it secure your more expensive guitars, but when someone asks for you to unlock it so they can try it out, it gives you a great opportunity to start up a conversation with them. Chris thought he had a pretty good idea when he sketched down a drawing for a way to lock up his guitar after his roommate “borrowed” it without his permission, again. It was during an entrepreneurial class in business school when he figured out that this idea might actually make business sense. 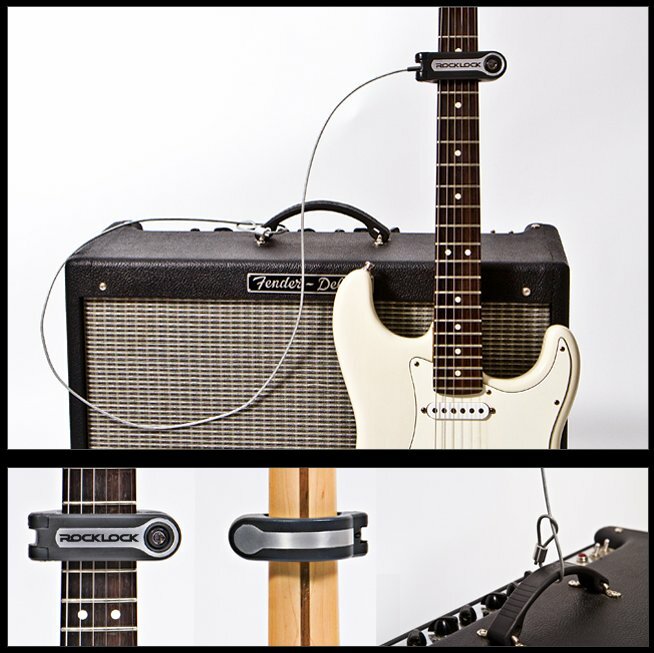 Loop the cable attachment around any fixed structure or large piece of equipment. Load the Rock into the Lock. Lock The Rock Lock and go sign autographs. “I’m a musician myself and know how valuable The Rock Lock can be,” Goulet added. “I really believe that any musician who appreciates their great guitars will be sold on it for life. Win a Rock Lock in our Facebook giveaway! Posted by Steve Matsukawa on Thu, 10/13/2011 - 17:11. Hope all is well with you and life is good! While I know that the price of the guitar is significant against the price of the Rock Lock, I do have a few guitars which would mean that I would have a nice sized investment in locks for my guitars. Perhaps package pricing options could be made available? I thank you for your time and kind consideration in this matter.